I have nicknamed it “Filthy Delicious.” The name says it all. What’s interesting to me, though, is the name of the cuisine boldly painted in red on the wall: 麻辣汤. This is interesting because once upon a time I was under the impression that this was the correct name, but enough chastisement from Chinese friends converted me to the “real name”: 麻辣烫. And yet there it is, in red and white, on the wall in the picture (in traditional characters, which, as you can see, totally adds class). The name 麻辣汤 makes sense, because the final character 汤 means “soup,” and the dish itself is a kind of soup. (As I’ve mentioned before, it’s sort of a spicy “poor man’s hot pot.”) The final character in the latter, “correct” one is 烫, which means “burning hot.” This makes a kind of sense, except that the name becomes then a bunch of adjectives without any noun (like “soup”) to anchor it. That noun would usually come last in a Chinese dish name (as in 麻辣汤). 1. Can the character 汤 have the reading “tàng” as well as “tāng”? This is not ideal, especially if there is no precedent in standard Mandarin. This would amount to a “corruption” of the character’s original reading. 2. Can we change the pronunciation of “málàtàng” to “málà tāng” for consistency? This seems ideal except that it would never work. It’s awfully hard to control how people talk, especially after they’ve settled on something. 3. Can we change the character used to represent “tàng”? If it comes from a dialect, it likely doesn’t have a standard written form anyway. If we can find something similar in meaning, a practical compromise is reached. If I have a point with all this, it’s that you can’t control the evolution of a language. Sure, a writing system need not necessarily do that, but when you encode individual characters with both semantic and phonetic information and then try to keep either from changing, you’re just kidding yourself. This is only a small example, but it’s a pretty widespread phenomenon now that the writing system is being used by the literate masses as a whole rather than a few elite (and the internet is certainly exacerbating the situation). Given enough time, so many characters will have their meanings muddled that the writing system will be reduced to the world’s most cumbersome “phonetic” system. I’d be really curious to see what the written Chinese language looks like in 2000 years. It’s not going to look at all like it does now. The one problem I see with your argument is that 麻辣烫 isn’t soup 🙂 Sure, there’s spicy broth, but it’s the stuff that gets scalded in the spicy broth that makes it 麻辣烫. Isn’t “process -> object undergoing process” a fairly common change? If 烫 is “to heat in water,” it’s not out of the question that it could change categories to mean “that which is heated in water.” 麻辣烫: “spicy, hot boiled stuff”. Food-wise, there’s also 炖 “to stew”, 乱炖, “stew”; 烧烤 “to sear”, 烧烤 “barbeque”. And then 关东煮, but that’s from the Japanese. Even if you take 烫 to be an adjective, “burning hot”, there are similar examples: take 大薄脆, a big, thin, crispy delicacy from Beijing. Why is 麻辣烫 more dominant than 麻辣汤 in China? The answer is very simple. The former sounds hotter than the latter………., or the character 汤 might not be suitable to the image of that noodle, which contains a lot of noodle and vegetables in it. According to some of my dictionaries, the two characters 汤 Otang1) and 烫 (tang4) seem to have a close relationship, in other words, in ancient China 汤 had both first and fourth tone, and it meant “burning” when you pronounce with the fourth tone. I guess that Chinese people later began to use (or created) 烫 instead of 汤 to clearly distinguish the two meanings “burning” and “soup”. Interestingly, two of my ancient Chinese dictionaries don’t even list 烫. The 康熙字典 contains 烫, but its definition is very short compared to that of 汤. Sorry, no concrete conclusion. this is a total guess but maybe it’s tang(1) in the south and tang(4) in the north because malatang in the south is a soupy noodle thing while northern malatang is just really spicy shish-kabobs. …in ancient China 汤 had both first and fourth tone, and it meant “burning” when you pronounce with the fourth tone. There are multiple examples of modern-day Chinese words that are written using one character, but whose tone changes depending on part of speech. Unfortunately, the only one I can think of off the top of my head is 中. I’m not sure if those can all be fairly grouped into one category, because they each tend to have a special story, like 发 (發/髮). This is off the subject a little, but I find the simple street vendors have the most flavorful foods. Im not sure if it is from the fermentation of the food, the residual on the cooking equipment or from the raw talent of the local cooks. But I actually prefer the simplicity and the unpretencious ambiance. So far as single characters that change tone when changing part of speech, there are famous examples like 买/卖, 王/王 (“king / to reign as king”), but I’m not sure if 汤/烫 is an example like this. It sounds like it should be one, certainly, but I’m doing a mad rush through freelance gigs before I head back to the States Tuesday afternoon, so I’m afraid I don’t have time to check the 辞海 to see when the character came about, though I can confirm that it isn’t in the 说文解字, suggesting that it’s a relatively recent character. It also isn’t in Karlgren. Can anybody identify the brownish yellow substance in the bucket? I’m afraid you’re right. For this reason I always shudder to see non-Chinese words written out as a long sequence of phonetic characters. Wouldn’t it be better to just use the roman letters? I know that there is a long tradition of importing words from Sanskrit and other languages, and I’m not saying this because I’m a cultural imperialist. It must be equally silly in Chinese people’s eyes to see our media full of atonal names and places (Deng Xiaoping, Shanghai, etc.) It just seems that forcing foreign words to conform to the few hundred syllables available in Chinese could seriously limit and distort the language. Re: The Chinese Writing of Tomorrow!, I reckon it will end up similar to modern Japanese. That is, we’ll see a lot more (mostly? dunno) pinyin or similar, with 汉字 chucked in to make the meaning explicit when things get too homophonous. Well, OK, I’m not saying that’s certain or even overwhelmingly likely, but it seems a reasonable possibility. Greg P: I agree, street vendors are the way to eat. It’s not so much that street food vendors are so great, but that Shanghai restaurant food is incompetent and sloppy quality, even the best of it. Agree with the street food = delicious comments, even if the stalls aren’t the cleanest places. One way to reconcile the potential “filthy” part of street food is to eat the spiciest kinds. Spices go a long way in killing bacteria. 5) △…..类篇 (1069年、30229字)　not sure. As far as I know, 龙龛手鑑 (long2 kan1 shou3 jian4) was the first major Chinese dictionary to list the character 烫 in history. This dictionary was edited by a Buddhist monk in 辽国 (Liao Dynasyt) in the late 10th century. At that time, 辽国 was struggling to compete against 宋朝 (Sung Dynasty) . A notable feature of 龙龛手鑑 was that it contained a great number of simplified and hetero characters in those days, therefore I suspect, completely groundlessly, that 烫 was possibly one of those informal characters which were used somewhere in the northern China, the main territory of 辽国. The most famous ancient Chinese rhyme book 广韵 does not contain 烫 in spite of the fact that it was published after 龙龛手鑑. I think that is probably because exporting 龙龛手鑑 to other countries had been strictly prohibited by 辽国 authority, and it was not until around 1.070 that a Chinese scholar obtained this dictionary. I suspect that 类篇 also does not list 烫 for the same reason. As for玉篇, I don’t think this dictionary contains 烫, because if it listed the character, it would be highly likely that 广韵 also contains the same character烫. Anyway, this posting has no contribution to 麻辣烫 discussion. It’s just out of my curiosity about 汤 and 烫! Yeah Im always telling my wife(who is Chinese) that I hate the big restaurants food because it tastes terrible and I think she just likes it because in China ‘expensive food must mean good food’ which I totally disagree with, street food all the way. I also think Yang has a point, in the past most places south of Beijing would be speaking their own dialect and ‘Tang’ would have originated in the North along with the language of present day China. 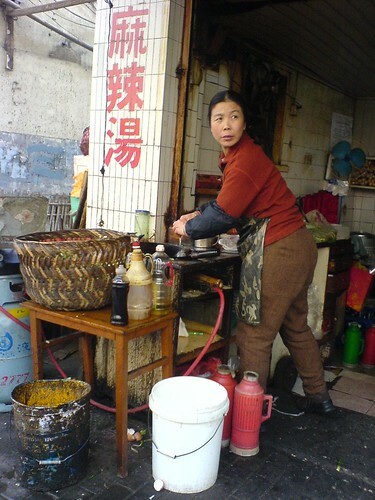 So look what they eat there and try to see how the han zi came about. This is why I love this blog! According to an advice from one of my Chinese friends (东北人, 汉族), the name simply expresses the features of this food, i.e. 麻 (pungent), 辣 (spicy), and 烫 (hot). I think this thought is very attractive, just as Yang’s one is. And another plausible, but not intriguing, answer to this problem is this phenomenon might be just the result of one of those wrong usages of Chinese characters. I found your website through your posting of “The Moon Represents My Heart” (wish I can type Chinese right now) on Youtube! I’m using your comments because I can’t find your e-mail on this site! First I want to say you got a very interesting blog here…. I came to the US when I was 10 years old from Guangzhou, province of Guangdong, China. I plan on going back to China after finishing up school. I just started reading your blog and it’s definitely very interesting. The reason I wanted to leave you a comment is because I wanted to see if you can e-mail me the mp3 version of “The Moon Represents My Heart”. Through youtube I see that you had a whole page dedicated to this song! Unforunately I can’t seem to get this song through youtube so if you can drop me an e-mail I would sincerely appreciated…I recently just heard this song at a Christmas party and it bought back a LOT of childhood memories…thanks again. Andy, Just go to Baidu and search for 月亮代表我的心 under the mp3 category – although I’ve never done anything illegal like this. Glad to see someone else uses google to check on the frequency of word usage in Chinese. I find it an incredibly useful (if not entirely accurate) tool for this. 烫 as a verb could mean “to scald” and as an adjective: “scalding”,”scalded”, etc… ie. 烫青菜=blanched greens. Therefore my interpretation of 麻辣烫 would be “numb and spicy scald”. This would simply be a Chinese equivalent of the “bake” in “clam bake”, or the “boil” in “lobster boil”, in which a verb can also be used as a noun by the addition of a preceding adjective. In Taiwan, there is a snack called 甜不辣. It may also have come from outside Mandarin, but it definitely follows the pattern of describing a food by its characteristics.